Southeastern Grocers Inc. today launched a new loyalty program that provides shopper rewards for food purchases that can be used at the pump. 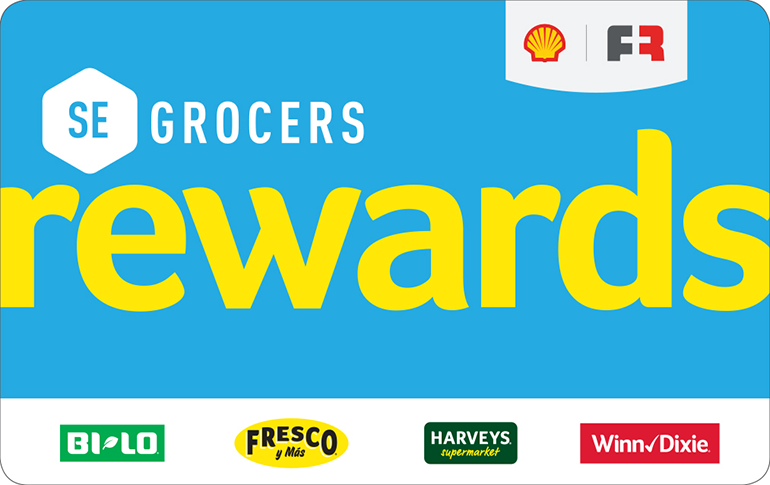 Called SE Grocers Rewards, the program enables customers at Bi-Lo, Winn-Dixie, Harveys Supermarket and Fresco y Más stores to earn points at checkout that can be redeemed for savings on groceries or fuel at participating Shell and other gas stations. The Jacksonville, Fla.-based supermarket retailer said SE Grocers Rewards also will offer bonus points on hundreds of products throughout its stores. In addition, customers can check their receipts to see more ways to earn points. Points are available for up to two years and expire on Dec. 31 of the following calendar year. To support the launch, Southeastern Grocers and Shell are offering the first 100 customers at a Shell-branded gas station in select markets with up to $40 per vehicle of free fuel. Customers can get updates on free fuel events in the Southeast through the end of July by visiting the Bi-Lo, Winn-Dixie, Harveys and Fresco y Más Facebook pages. SE Grocers Rewards members who swipe their card at participating filling stations will be enrolled in Shell’s Fuel Rewards program and receive Gold Status, saving an additional 5 cents per gallon on every fill, up to 20 gallons. SE Grocers Rewards replaces Plenti, a coalition loyalty program that enabled consumers to earn and redeem points for purchases at all participating companies. Plenti ended on July 10 after it stopped accepting new enrollments in mid-April. To transition to the new loyalty program, Southeastern Grocers customers who present their Plenti card at checkout will get a SE Grocers Rewards card and welcome kit. The value of unredeemed Plenti points will be issued to the new rewards program for all fully registered customers. Southeastern Grocers rolled out the Plenti program across its supermarket banners in April 2017 following a pilot in Harveys Supermarkets launched in the fall of 2016. The company was the first grocer to join the American Express-operated program, which was described as the first U.S.-based coalition loyalty plan when it launched in the spring of 2015. Plenti enabled consumers to earn and redeem points for purchases at such companies as American Express, Rite Aid, Macy’s, ExxonMobil, AT&T, Nationwide, Direct Energy and Hulu. Overall, Southeastern Grocers operates about 575 stores in Alabama, Florida, Georgia, Louisiana, Mississippi, North Carolina and South Carolina.